Wear your new patch with pride . . . you've earned it!!!! The US Army uniform board has just released a new patch for those trapped in staff positions and who have served above and beyond the call of duty in making time consuming POWERPOINT presentations day after day, week after week, month after month without recognition. The new "PPT1000" patch, shown above, is authorized to those who have put in at least 1,000 hours on PPT presentations. Subsequent awards for 2,500 hrs, 5,000 hrs, and 10,000 hrs are to follow. Posthumous awards for those putting in over 25,000 hrs will be presented to the next of kin, upon request. The patch may be sewn on the right shoulder of the battle dress uniform or affixed to the flight suit/ACU with Velcro. A special pin version will be developed for the Army Class A uniform. Subdued versions are not authorized at this time. Similar patches have been authorized in the past for serving in combat, but since our real mission today is to beat the other services out of $$$ by creating spectacular PPT slides, the Board deemed this was absolutely appropriate at this time. Please submit your request to your commander or servicing MILPO for issue. A similar patch and pin is under development for qualified Excel operators. Microsoft Word operators will not be recognized because the Army chooses to avoid the preparation of written products, particularly with signatures. Recognizing the need for an award for troops assigned to headquarters units during combat operations, the Army today announced the approval of the Combat Briefing Badge, or CBB. "People don’t realize that being in a major headquarters can be just as stressful as going on patrols or convoys," said MAJ John Remf. "When you’re briefing that many General Officers, your career can end in a heartbeat. And it can happen to anyone at any time, not just combat arms soldiers." DOD statistics note that CSS personnel are more likely to suffer career-ending incidents in rear areas than Combat Arms Soldiers. "This just reflects that reality," said Pentagon spokesman LTC Roger Pogue. This is my PowerPoint. There are many like it but mine is 7.0. My PowerPoint is my best friend. It is my life. My PowerPoint without me is useless. Without my PowerPoint, I am useless. than the other J-cells who are trying to out brief me. I must brief the impact on the CINC before he asks me. I will! is the new information that counts. We will brief only new information! My PowerPoint is human, even as I, because it is my life. Thus I will learn it as a brother. its accessories, its formats, and its colors. I will keep my PowerPoint slides current and ready to brief. We will become part of each other. We will! defenders of my country. We are the masters of our subject. We are the saviors of my career. but peace (and the next exercise)! Download the PowerPoint Ranger Presentation. ! 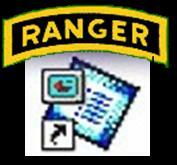 'PowerPoint Ranger' is a derogatory term for a desk-bound bureaucrat more adept at making slides than tossing grenades. Briefings held, and changes made. and PowerPoint is the only way. Briefing's late so heads will fly. Full-color slides, they look the best. But only 3 were ever displayed. Slides were done and looked just great! Briefing's done, slides up to date. One more chance, or you go home. So tell my mom, I've done my best. Pin PowerPoint Slides on my chest. It was written on July 4, 1996 in Taszar Hungary at about 3 am in the office of the ODCSENG USAREUR (FWD) during Operation Joint Endeavor/Guard. LTC Jorge Guiterriez was setting at a desk trying to get a slide brief done on his computer and had about 250 slides he was trying to reduce. It was just too much information for one brief of about 15 minutes. So he had to chop them down to the bare minimum. So the song was dedicated to him. I know because I was the one who wrote the song. Since that time it has been all over the world, and I take great pride in the song. I was the night Engineer TOC Operations Officer for COL Johnson. He was from the 130th Engineers in Germany. Our staff came from the 412th Engineer Command in Vicksburg, MS. I was just an E-6 at the time. We gave LTC Guiterriez his retirement party yesterday in Vicksburg, MS and I dedicated a part II to the song just for him at his retirement, along with the remaining staff from that operation. There are only two in the unit now from then, the rest that were there with us are gone to play in the sand. * Sung to the tune of "The Wreck of the Edmund Fitzgerald"
of the thirty meg PowerPoint briefing. when the God of Electrons grows angry. it was said that no one could outbrief them. when the God of Electrons came calling. when they left Wuerzberg bound for Tuzla. with a battle captain well seasoned. and a master with mouse and a laptop. and demanded his graphics and bitmaps. and the Bubbavision TV only flickered. but the Term Shop was bound and determined. with the turnover of April upon them. or the G-2'd be left with no briefings. sayin' "Fellas, the room is a'fillin". he said "fellas it's been good to know ya". SFC Taylor called down, "we got generals coming in"
and the good ACE and crew was in peril. came the crash of the PowerPoint briefing. when the briefings turn minutes to hours? if he'd put ten less meg on the hard drive. He might have enlarged his server. of the spouses, the sons and the daughters. In the room that houses the Great Bubba. for each meg in the PowerPoint briefing. when the God of Electrons grows hungry. "Someone needs to come up with an SF Tab for PowerPoint because we all know that there is no one more powerful with a computer than a PowerPoint Ranger with an SF Tab. SF meaning Slide Flipper of course! When put in charge of such a highly prestigious mission as being the Slide Flipper, one deserves to be wearing such a tab to show off their special talent." Webmaster's note: The "slide flipper" ASI is automatically awarded to all chemical officers upon successful completion of the basic course. Eyes glaze, heads droop, heartbeat stops. Power Point Ranger, Hell of a Man! Walked into the 'Gon with his brief in his hand. Made a two dollar bet he could brief them all. Then he backed off, rebooted and briefed the other two. Briefed the Devil himself and Billy Gates as well. "Here lies the human PowerPoint Machine!" Hopefully you're "old soldier" enough to remember the original. bulletize: To highlight supposedly key information using bullet points. "To help explain my idea, I've bulletized the main points on the next slide..." Often used by people who can't explain themselves in complete sentences. DBT: Death by Tweakage. When a slide fails to convey its intended meaning due to unnecessary tinkering or too many last-minute revisions. "Why did the new slide fail?" "It had the DBTs." deck: A staple of every military meeting -- the PowerPoint "slide" show. "There were only 12 slides in the deck, but the presentation lasted an hour." Eye chart: An information-laden PowerPoint slide with small type. Often introduced with: "I know this slide is tough to see, but..." Example: "As we showed on the bottom line of the eye chart I covered a few minutes ago, we had a 31% increase in net revenue." "As a professional Army officer, I don't know if I can brief without PowerPoint." Comment made by a DTRA staff officer when ask to provide information about his mission space.
" Preparing a PowerPoint presentation will give you the sweet, sweet illusion of productivity." "I hope these viewgraphs don't insult your intelligence - they were prepared for management." "I generally believe that PowerPoint is the spawn of Satan. It breeds passivity in the students and it disconnects the speaker from the audience." Professor of biomedical ethics and philosophy at the University of Virginia. "It's like a plastic banana…looks good but provides no nutritional value or sustenance." Quote relates to many PowerPoint briefings he has seen. "PowerPoint – nothing to say and hour in which to say it." Point-CounterPoint: PowerPoint and the Dumbing Down of America. "No useful information is every conveyed in a Power Point Briefing." "Officers know that the more warning one has for a briefing, the more cheese one can provide for the briefing. Improving content is secondary." "Powerpoint Jedi use their skills at PowerPoint to make difficult concepts clear. Me, I’m a PowerPoint Sith. I use my PowerPoint skills to confuse and obfuscate. If my boss doesn’t have a glazed look of bewilderment, then the brief isn’t complete. Embrace the dark side." "I must say I started to see more bad plans with good slides approved over good plans with no slides." "I get to play PowerPoint ranger for a few weeks every quarter… sux." "I am happy to report that Memorial Day 2005, in Southern Baghdad Iraq was fairly boring. Aside from having to generate countless PowerPoint slides unnecessarily repeating information that could very easily be relayed over the phone. Why communicate in a 2 minute conversation when you can generate an 18 megabyte presentation that the near dial-up speed bandwidth we call internet access can't handle sending? Ah, yes progress." "While you were making your slides, we would be killing you." In a discussion between US and Russian officers serving in Bosnia as to who would have won if we had ever actually fought in Western Europe. The PowerPoint Society: The Influence of PowerPoint in the U.S. Government and Bureaucracy Gregory S. Pece, Masters Thesis, Virginia Polytechnic, 10 May 2005. Point-CounterPoint: PowerPoint and the Dumbing Down of America. Childress and Howell., Emporia State University, 4 August 2004. Absolute PowerPoint: Can a software package edit our thoughts? Ian Parker. The New Yorker , Annals of Business Section, Pg. 76, May 28, 2001. Nobody Asked Me, But... Order a PowerPoint Stand-down Captain E. Tyler Wooldridge III, U.S. Navy (Retired), Proceedings, December 2004. Does PowerPoint Make Us Stupid? CNN article. Rock star David Byrne turns PowerPoint into art. PowerPointitis: Glitz Over Content By Giancarlo Livraghi. Visionarymarketing.com Article. PowerPoint Is Evil. (Power Corrupts. PowerPoint Corrupts Absolutely.) By Edward Tufte. Wired Magazine, Issue 11.09, September 2003. Humorous Cover of "The Cognitive Style of PowerPoint" by Edward Tufte. PowerPoint Makes You Dumb By Clive Thompson. The New York Times Magazine, December 2003. Does PowerPoint Make You Stupid? By Tad Simons. Presentations.com. Absolute PowerPoint (Can a software package edit our thoughts) By Ian Parker. The New Yorker Magazine, 28 May 2001. The Level of Discourse Continues to Slide By John Schwartz, The New York Times, September 2003. Check out Squad-Leader.com’s tongue-in-cheek salute to all the PowerPoint Rangers ! You can also order Power Point Ranger Tab t-shirts, coffee mugs, mouse pads, etc. Can’t we say ‘that’s all folks’ to PowerPoint presentations? It saps the will of the toughest combat leaders. It burdens even the most highly conditioned elite soldier. It causes immense suffering, agony, sleeplessness and fear. It consumes priceless time, energy and attention. And if something isn’t done to stop it, it will eat away at our Army like a cancer from within, ultimately jeopardizing our ability to execute our primary mission — to defend our nation and win our nation’s battles on the ground. 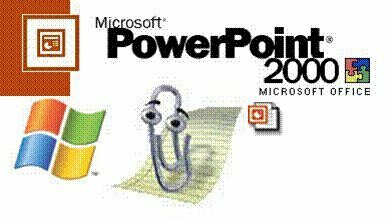 I am referring, of course, to Microsoft PowerPoint — perhaps the deadliest weapon ever deployed against our Army. It is fifth column software that destroys us from within. It started out innocently enough. We used to get our orders verbally; maybe a mimeographed operations order if we commanded elements (even now I get a little jolt from that ditto smell). Then came the index cards — just experimenting, mind you, just to "jot a few things down." Then we moved on to stronger stuff — butcher paper. Desk-side flip shows. Just "talking" our main points. No big deal. Let me just write this up for you. But soon butcher paper didn’t give us the high we’d come to expect after graduating from staff courses and instructor training. We’d learned to do the "flip" with acetate film and jury-rigged bits of cardboard on our overhead projectors, and we liked it. The sixth point of performance became "Check screen for white light and extinguish." But the buzz got harder and harder to find. Some wise guys who had computers at home started showing off around the War Colleges and Joint Staff, bringing their "presentations" to the briefing, scoring points with the high-and-mighty. Now, all the generals and admirals, the colonels and the captains, started telling their staffs, "I want that." Pretty soon, PowerPoint images were showing up in our doctrinal publications. How many times have we seen that same image of the captain and the sergeant, looking manfully off into the distance? Pointing out an enemy observation post? The addiction filtered down the chain, to brigade, then battalion, then company. Well, I say, no more slides! How many hours of labor have gone into VIP briefings? Staff recommendations? Do we really need 100 possible courses of action cost-benefit analyzed and PowerPoint-ified, especially when we’re only going to recommend one or two? Does the boss really need to know why Course of Action No. 57 ("Surrender to the enemy and make paper dolls.") didn’t make the cut? And does it merit a slide? I’m proposing a quixotic campaign against the received wisdom. I’m an apostate staff puke, and proud of it! Information operations? Try information overload. But it wasn’t always thus. The Combined Chiefs’ order to Gen. Eisenhower to commence offensive operations in Europe is 30 words long. The Gettysburg Address, perhaps the finest piece of oratory in American history, is 266 words long and takes 90 seconds to recite. Is a Humvee with a flat tire so much more important that it needs to be briefed? The slide is supposed to be an aid to a briefing, not the focus of it. PowerPoint is supposed to be a tool — not an additional skill identifier. Somewhere along the line we lost sight of this simple fact: The brief is a means, not an end. Let’s kick the PowerPoint habit. Let’s discriminate, judge, assess. Let’s focus on what’s useful, productive and important, and get rid of the electronic cholesterol that is clogging the system. And for Pete’s sake, stop copying to me every slide show that comes your way. Well, I feel better. Now let me get back to updating the weekly slide update before the quarterly slide update suspense hits. Otherwise, I’ll never get around to the annual slide-update slides. 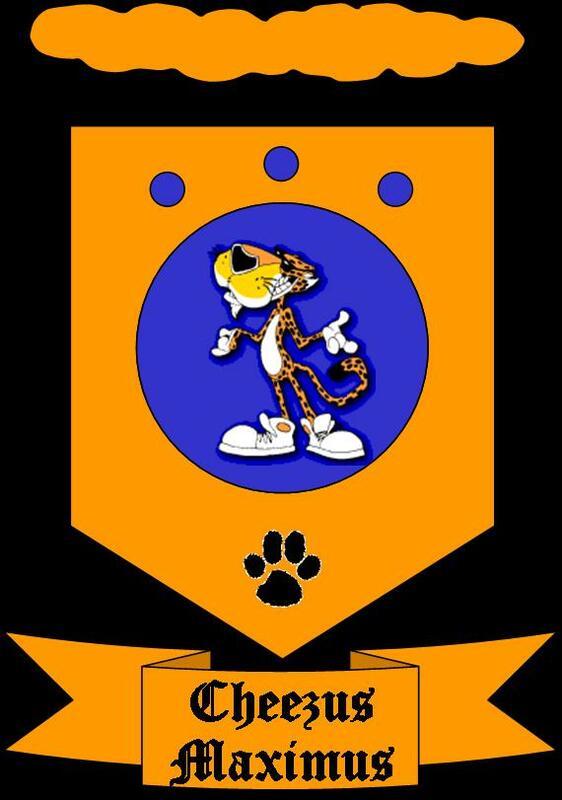 COAT OF ARMS: Chester the Cheetah with sunglasses and thumb on left hand elevated. CREST: On a wreath and vert, issuing from a wavy cheeto. “IT AIN’T EASY BEIN’ CHEEZY”! WASHINGTON -- Earlier this year, Gen. Hugh Shelton, chairman of the Joint Chiefs of Staff, issued an unusual order to U.S. military bases around the globe. His message: Enough with the bells and whistles -- just get to the point. It seems that e-mailed military briefings larded with electronic "slides" of booming tanks and spinning pie charts were gobbling up so much of the Defense Department's classified bandwidth that they were slowing more-critical communications between headquarters and units in the field. "The chairman basically told everyone that we don't need Venetian-blind effects or fancy backdrops. All we need is the information," says one senior Defense Department official. Shelton's order is only the Pentagon's most recent assault on a growing electronic menace: the PowerPoint briefing. Sure, business executives complain about the seemingly endless PowerPoint presentations put on by overeager middle managers in darkened boardrooms across America. But in the military, the Microsoft program, which helps users create computer-based graphics and sound effects, has become one of the most dreaded facts of life. And it's even shouldering the blame for at least some of the armed forces' ills. PowerPoint-induced coma Congressional support for new weapons programs isn't as strong as expected? Army Secretary Louis Caldera suggests that PowerPoint presentations are alienating lawmakers. "People are not listening to us because they are spending so much time trying to understand these incredibly complex slides," he says. Too many bright, young junior officers are leaving the military for the private sector? 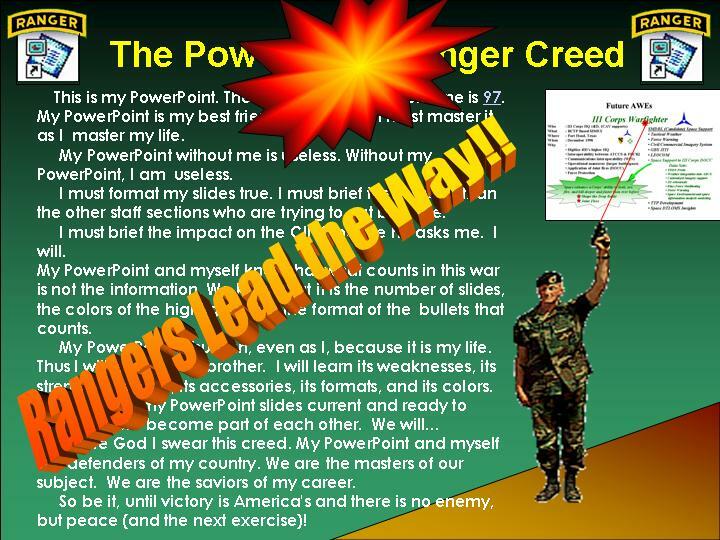 A recent survey of captains at Fort Benning, Ga., cites the "ubiquity of the PowerPoint Army" as a prime reason for their disaffection. "The idea behind most of these briefings is for us to sit through 100 slides with our eyes glazed over, and then to do what all military organizations hope for ... to surrender to an overwhelming mass," says Navy Secretary Richard Danzig. Old-fashioned slide briefings, designed to update generals on troop movements, have been a staple of the military since World War II. But in only a few short years PowerPoint has altered the landscape. Just as word processing made it easier to produce long, meandering memos, the spread of PowerPoint has unleashed a blizzard of jazzy but often incoherent visuals. Instead of drawing up a dozen slides on a legal pad and running them over to the graphics department, captains and colonels now can create hundreds of slides in a few hours without ever leaving their desks. If the spirit moves them they can build in gunfire sound effects and images that explode like land mines. "There is an arms-race dimension to it," says Peter Feaver, a military expert at Duke University and frequent PowerPoint briefer at various war colleges. "If there are three briefings in a row, and you are the one with the lowest production values, you look really lame." "This is my PowerPoint. There are many like it, but mine is [PowerPoint] 97. ... I will learn it as a brother. I will learn its weaknesses, its fonts, its accessories and its formats ... My PowerPoint and myself are the defenders of my country. We are the masters of our subject. We are the saviors of my career." The parody is zapping around the Defense Department as a PowerPoint slide complete with the sound of explosions and featuring an animated John Wayne in Army Ranger garb wielding a laser pointer. How did a piece of technology that was supposed to improve communication become a barrier to it? Some military sociologists say the endless presentations are a product of the military's zero-defect culture, in which one mediocre review by a superior can torpedo a career. "Young officers are worried that they might leave something out of their briefing, and a supervisor might say something about it. So they pack their presentations with every detail that they can think of," says Charles Moskos, a military-culture expert at Northwestern University in Evanston, Ill.
Others blame the problem on the absence of a formidable enemy. "We crave something that explains who we are," says retired Army Col. Henry G. Cole. "The PowerPoint game creates the illusion of control. All those moving arrows and graphics become reality for a military that is trapped in this permanent state of shadow-boxing an enemy that no longer exists." Frontal assault whatever the cause, a handful of senior Pentagon officials have decided to attack the PowerPoint problem head-on. 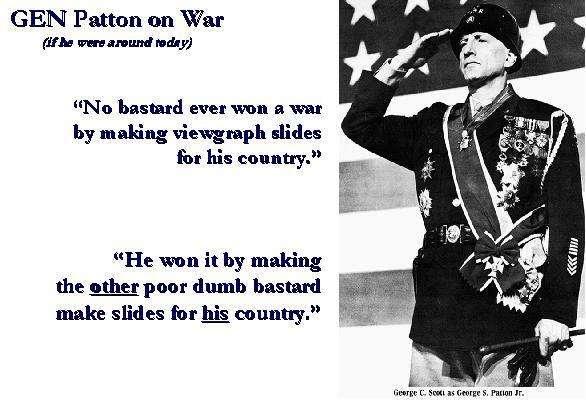 Navy Secretary Danzig announced late last year that he was no longer willing to soldier through the slide shows. He maintains that PowerPoint briefings are only necessary for two reasons: If field conditions are changing rapidly or if the audience is "functionally illiterate." "In the Pentagon the second seems to be the underlying presumption," grouses Danzig, who now asks to get all his briefings in written form. Danzig's Army counterpart, Caldera, says he, too, would ban the presentations if he thought he could get away with it. "For some of these guys, taking away their PowerPoint would be like cutting off their hands," he says. Caldera's strategy is to interrupt the show with questions when he gets bored. Despite such countermeasures, PowerPoint is showing no signs of retreat. Indeed, it seems to be spreading. James A. Calpin, an officer in the Naval Reserves, just returned home from duty in Operation Northern Watch in Turkey, where PowerPoint has just begun to surface in officer presentations. "I was able to come in and spruce up their briefings, and they were just wowed," he says. "People over there just loved it." Foreign armed services also are beginning to get in on the act. "You can't speak with the U.S. military without knowing PowerPoint," says Margaret Hayes, an instructor at National Defense University in Washington D.C., who teaches Latin American military officers how to use the software. Unfortunately, Hayes admits many foreign officers, including those fluent in PowerPoint visuals, still struggle to understand their U.S. counterparts' complicated slide presentations. "We've gotten away from inviting our colleagues from the Department of Defense to brief our visiting officers. Some of their presentations are a little bit too complex and too inhibiting," she says. All of which makes Duke University's Feaver wonder if the U.S. military is misusing the technology. "If we really wanted to accomplish something we shouldn't be teaching our allies how to use PowerPoint," he says. "We should give it to the Iraqis. We'd never have to worry about them again." And the flickering, lamplight’s ember wrought its ghost upon the floor. Soon its Generals would bore. So to re-engage the beating of my heart, I stood repeating. So I opened up the door. And the only word there spoken was the whispered, "Oh, you whore!" 'Tis an e-mail, nothing more!" Tell me what thy real screen name is on this night when others snore!" Quoth the Clipman, "Who’s the whore?" Spouting words like "Who’s the whore?" Those three words, as if his soul into those words he did outpour. On the morrow he will laugh at me when there is hope no more." Then the Clip said, "Who’s the whore?" Was now comforting no more! Streams of foul obscenities bounce off my cold linoleum floor. File to just the wretched hard drive that retrieves the file no more! Why did you not back the file up on a disk just once before?!" Quoth the Clip Man, "Who’s the whore?" "PowerPoint!" said I, "thing of evil! -- PowerPoint still, if clip or devil! Is there -- is there hope I’ll find the briefing? -- tell me, I implore!" Quoth the Clip Man, “Who’s the whore?" Backed up and retrievable so I can brief the silly Corps." "Get thee back into the tower and my hard drive’s churning core! Leave no echo as a token of that curse thy soul hath spoken! Leave my loneliness unbroken! -- quit this game and smile no more! Send me a picture of you and your PowerPoint patch/tab with something interesting/unique in the picture! If I post your picture on the site, I will send you a free patch of your choice. Will consider chemical unit coins and/or distinctive insignia in trade.